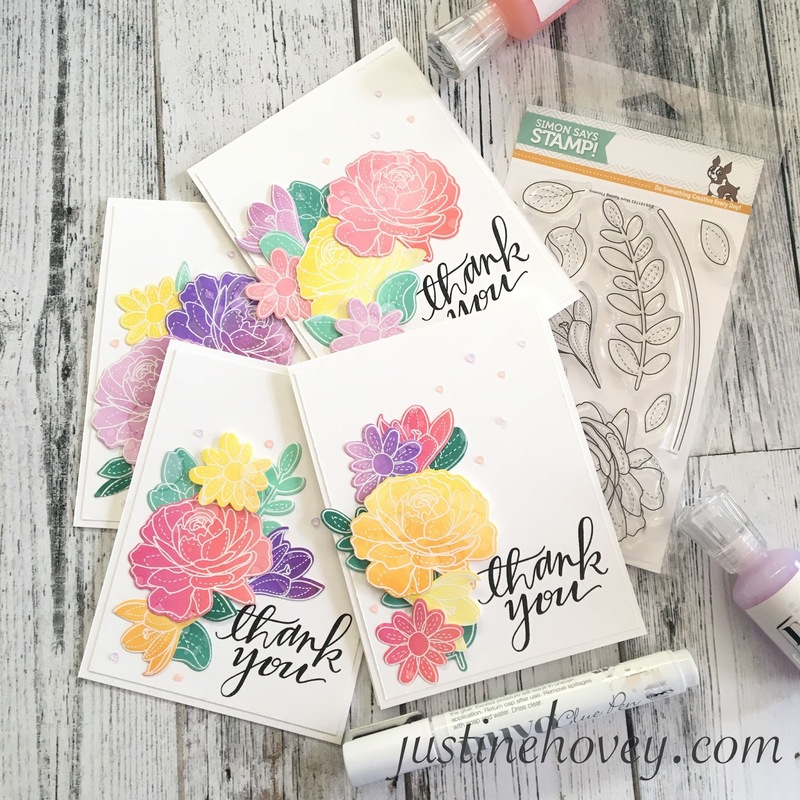 Justine's Cardmaking: Bulk MISTI Card Technique + Simon Says Stamp Giveaway! Bulk MISTI Card Technique + Simon Says Stamp Giveaway! I hope you enjoyed the video hop to kick off my April celebration of 1 Million Youtube Views where you have a chance to win FIVE fabulous giveaways. And as promised, I will have a video and giveaway each weekday this month. Today I have a wonderful bulk card tutorial. As I mentioned in the video, if I were to have created one card, it would have taken me about 30 minutes. I made four cards in 40 minutes - much more efficient use of my time. Today's giveaway for a $25 gift certificate is sponsored by Simon Says Stamp (see entry details below). I love all the details of the collages and I love how each card is unique and different! 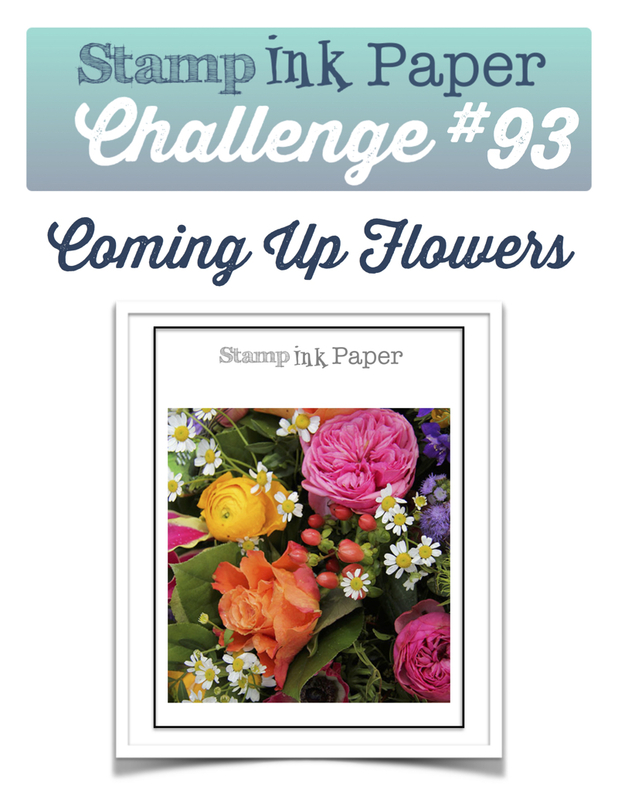 The More Spring Flowers Stamp and Dies Set is great for any occasion! I have linked to both the stamp and dies separately, as well as the bundle with both included. (If you are inspired by my videos or blogs, please shop through the links. I make a small commission at no cost to you that helps support my blog, channel and future giveaways. Beautiful job on these cards Justine , the stamp set is very tempting 😆 . Love these cards, so awesome and quick. Thanks for sharing. Love your videos. I love making multiples of a card, it does save so much time. I like your technique for the flowers and leaves, I'm going to have to try doing it that way next time! Gorgeous cards, I love these flowers and the technique you used makes them look even more beautiful! Again congrats on the milestone! What a great technique! Love the colors. Great tutorial! You always do wonderful tutorials. I'm also trying to do more multiple cards at once. CONGRATULATIONS on your accomplishment! Wow, I love how you were able to make so many cards using the stamp set with the misti. Flower stamp sets are one of my favorites. I don't have that exact one but am excited to try this technique with the ones I already have! Thanks for the inspiration! These are beautiful. Thanks for sharing. I'll have to give it a try when I get my replacement magnets for my MISTI mini. Such a great idea. Love them. Love the bulk card idea and the inspiration to do more of them. Keep up the good work! Wow Justine!! The color blends you used were stunning! Love them!!! Congratulations on your success and thank you for sharing all these inspiring videos! Love the cards. Thanks for the inspiring video and the chance to win. Love all the pretty colors of your flowers, they make such a happy card! very pretty cards.....would make a great gift pack for someone.....thanks for sharing!!!! Great video as usual, I must give this technique a try!! Thanks for the awesome video! Love your ideas and these cards are fabulous!! Beautiful cards, I love how you where able to get so many color options and combinations out of the flowers! Will be using your method for making multiples of cards. I love my stamp positioner...really saves time. Thanks for your videos...they are helpful. Beautiful cards as always! I was on the fence about this stamp set but u made me want it now! Your beautiful flower cards, heralding the arrival of Spring, are exactly what I needto brighten this rainy, cloudy day! Thank you for yet another engaging video; so enjoy watching the magic unfold! Inspired and inspiring! I really enjoyed your video and learned a lot. Thank you for making these videos and instructing those of us who are inexperienced with card making. I love your ideas! Beautiful cards! Great cards! These would be a wonderful gift. Beautiful set of cards! I love the color variations and gorgeous flowers! Beautiful cards. Thanks for sharing. Love the cards!! REally want this stamp set - have the original and the christmas sets. Loving the misti for making multiples, so practical and efficient!! Love this stamp set! Very cool, quick card that is beautiful! Awesome technique. This makes my day! Thank you for sharing. Beautiful cards, loved the stamp set. The Misti is really a god send when doing a lot of cards. Yes! Please do more bulk card videos. They are such time-savers and you end up with so many more pretty cards! The cards you did today are just lovely.! I always enjoy your cards, your tutorials on Distress Ink were how I got started with that product! Your cards are lovely! I tried to pin the image but there was nothing there to pin. Sorry! It is fixed now! Thanks for pointing that out! Pretty cards. Nice way to get several cards done at once. I love it that we can be efficient, and still create beauty. Thanks! I LOVE making bulk cards, such an efficient use of time! I love these cards so much that I'm going to try your method today! Thanks for sharing! Thanks for the inspiration. Congrats on your 1,000.000 views! Love how bold and bright these flowers are! I love the cards and I so want that stamp set and the new garden one from Altenew. Love both of the set. Your cards are so petty. Super cute card! Love your clever techniques for ombre effect. I am going to try your techniques. Gorgeous cards Justine, I just ordered this stamp set and now I'm even more excited to get it! It is such a smart idea to make more then 1 card when u have everything out, I really should try this myself. Thank you for an awesome video, and a chance to win the giveaway!!! Thank you for turning me on to the nuvo drops! Love them! Love these cards! So pretty! Love the cards. Yes, I think it is better use of time to make more than one. Those Nuvo drops are great. These are beautiful! I need to try this! Beautiful cards, love the mass card production, I find it more efficient use of my craft time too. Love those Nuvo Drops on your cards, a pretty detail. I really enjoyed this video since I am drooling over these two stamp sets right now from SSS. Beautiful work and I love this batch card making technique. Very nice card set! Love the colors! Thanks for your giveaway and inspiration. Happy I discovered you and your beautiful cards! Absolutely love the distressed colors and how you put the cards together! They turned out beautiful as all your cards do! Thank you for the opportunity to be in the giveaway pool!! Love this idea! What cute cards. Great cards and tips. I often forget that it doesn't take that much more time to do bulk cards. Great reminder. I need to get faster with my card making, Justine! 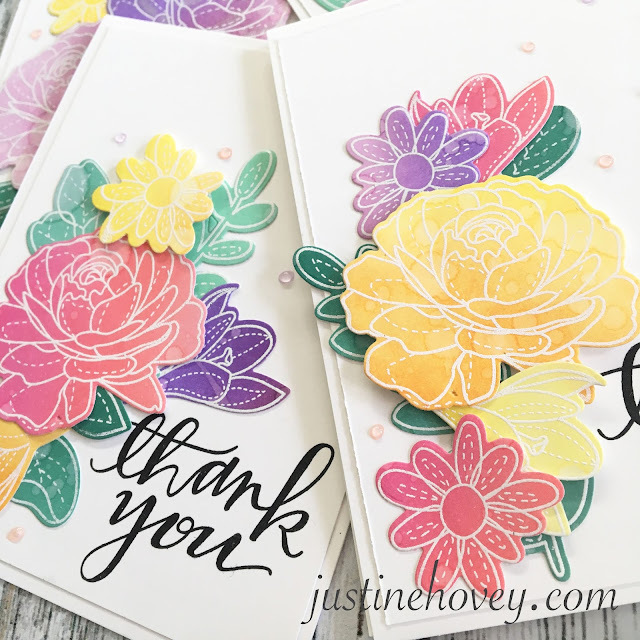 I like how you used distress ink panels to cut your flowers from...the transition of color on each flower and leaf adds a lot of interest! Thanks for sharing! I just started my distress ink collection...I'm definitely going to add this to my list of things to try!!! Great idea for coloring the flowers! What a beautiful card. I'm really loving flowers right now and this is a great way to put them to good use!! Thanks for sharing! Beautiful cards. So much easier to make multiple cards with the Misti. Thanks for another great video. I'm looking forward to the others this month. Terrific cards, that stamp set is so very pretty! And I try to make duplicates when making just one also!! sure is a time saver! Beautiful! Love how you made this and can't wait to study your video!!! I love the beauty of your cards and they didn't turn out the same. 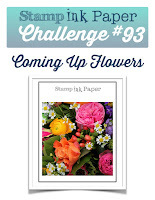 Simon says stamp has some products l can't wait to try, the next time l am at the craft store. Great cards. Like the idea of make no several. Absolutely gorgeous. I just love the colors. Great and clever tutorial ! No more white borders on die cuts. I love that ! Thank you ! Such beautiful colored cards, thanks for the video. Stunning cards! You make this look so easy! Your explanation for why making bulk cards actually saves time makes so much sense. I've often made bulk cards just because I use a Cricut or Silhouette so I'm already cutting into that sheet of paper. I just bought a stamp positioner so I have to keep that in mind for my stamped cards too! Love your cards! What a great idea to make a whole set!!! Thank you for sharing!!! beautiful! I like how you colored the paper before die cutting! These are a gorgeous set of cards. I love them. Such a fun Springy card! Love your video. Thanks for the chance to win. Well done, Justine. The stamps are so unique with the stitching element. And I'm with you.....multiple cards at one sitting.....why not??? Beautiful cards. Live making more than one! I think the biggest time saver here is inking/blending the paper *before* stamping. When we stamp and emboss first, we get way too fussy with the inking and this technique takes that element out of it completely! Slap the ink on without any regard for placement or shading, and it still comes out just beautiful!!! Lovely cards! I really like the idea of distress ink blending first, then stamping the images! love the cards! definitely into the idea of making cards in bulk since there's so many occasions you could use flower cards for! So beautiful, Justine!! I love the Distress blending and making a few cards in bulk this way. They are similar, but different still. Love this! Really smart to do multiples for the reasons you mentioned. Even better when they are as pretty as these! Wow these are beautiful! I'm just starting to attempt bulk card making. I just recently subscribed to your youtube channel and so glad I did. You are very informative, awesome cards, and ideas. Thank you for sharing your talent and time. Great tips for making multiples! Gorgeous cards. Extremely pretty cards. Love the colors you used and adore that stamp set! Great job. Lovely cards and really great tips for bulk production--thanks so much, and congratulations! As always Justine, I love your cards. Your blending is always flawless! I love the little pad under the ink pad, I've started doing that. These cards look so much more complicated than they were. what a great idea for making more cards in an efficient way! these are beautiful cards too! Great cards, will watch video on the big screen! I love your beautiful cards. I enjoyed the video very much. Beautiful cards and a great way to do multiple cards. Beautiful flowers. Bulk cardmaking is a great timesaver. Smart idea. I only ordered these stamps and these cards really make me want the dies! Love the "bulk" method of making cards, and your wonderful use of color! Lovely way to do this. Lovely cards. I'm trying to do more cards this year also. Good luck! Awesome cards! Love the colors and design. I'm so glad that I discovered your YouTube. Your work is great. This is such a great way to use outline stamps in a new way! It would also be great to add colored pencil detail to as well. Thank you for the technique! Love watching your videos! I need to get some distress inks! Loved the video and the cards. I almost always make two of the same cards at every session. It just makes sense. Love this Justine! I have the other SSS stamp set similar to this and needed ideas. Such fun, spring-like colors!!! Congrats on your milestone and TFS. Wow. This is great. Time saver and beautiful. What a great way to mass produce cards! Thanks for the tip. Of course you would use ink blending in a way I hadn't thought of! It turned out sooooo pretty. Love these cards! I think I'm going to have to make a few using the distress technique! I love, love, love your cards! Great idea to distress a bunch of different colors at a time to make multiple cards. I have to start doing this. Beautiful set of cards! I love your blending with the distress inks!! I love your cards, always! But I really enjoy your sense of humor & style. You put such thought in your cards. And it really shows your love of what you do!! Keep up the great work!! Congratulations again!! Lovely cards! I love using the Misti for bulk cards. I just finished making 60 thank you cards for my cousin's wedding. I don't know how I could have done that without the MISTI!! Beautiful set of cards! I just ordered that stamp set and am awaiting its arrival. Can't wait to play with it! Congratulations!!! These cards are beautiful!! I love that you got so many cards out of this one effort...I'm going to try to do that this year! One question...what container are you using for your mini distress inks? I never think to make multiple cards at one time until after I've completed the project lol! Beautiful cards! Great cards! Now why didn't I think of that? Lovely bright spring colors. Thanks for the video. I love making sets of cards like these! Great cards! Thanks! These are wonderful - thanks so much for sharing!! I am just starting to learn how to make my own cards!!! I absolutely love these! Thank you for sharing your talent with me!!! Such pretty cards and love the technique. Thanks for the tip on multitasking. Beautiful cards! Thanks for sharing. Really beautiful and bright cards! So, so pretty! Thanks for the inspiration! Beautiful! Please keep sharing ideas on making multiple cards at one time. I love doing that and gifting people with a small set. Loved the video on this Thank You card. The flowers are so nice and so is your technique! What a beautiful set of cards! I've been eyeing this stamp set! Oh Justine...What Gorgeous Cards....they are Breathtaking. I truly enjoyed watching you create each one....and the colors are so beautiful. Thanks for a chance in your most generous giveaway!! YOU so ROCK!! Congratulations Justine on million views. Beautiful cards Justine, I love this stamp set and just may have to purchase it. Thank you for sharing. Great technique to create cards in one time. Thanks for sharing. I will try making multiples, thanks. I love your card. Thank you for the video on making bulk cards. I love these! I wish I could figure out how to blend distress inks. I have tried for months and just can't do it. Beautiful set of cards!! Love the flower arrangements you have made. I am nit sure what I would spend my gift card on.... stamps or Oxide Inks! I like the idea of bulk stamping. I haven't tried this yet but I intend to do it soon. Love your cards. That's a creative way to do many cards at once. Thank you!! That was just the inspiration I needed to see today! Love the distress ink blending and then stamping over to die cutyour flowers. what a beautiful s=effect and a time saver to boot. Super pretty cards! Those Nuevo drops are cool. Love your cards, those flowers are really pretty, and loved how you did the panels for the colors then stamped on them! Worked great, will have to try and remember that myself! Wow! Awesome cards!!! Colors are simply amazing!!! I find it so soothing to watch you create your cards, Justine, even at warp speed! I love the idea of making more than one while you have all the supplies out. A time-saver and also adds to the creativity, as each one ends up being slightly different. Thank for the chance to win a SSS gift certificate! I love the colors and all your videos! I love your cards you made and the techniques you showed us. Thank you for the chance to win a gift card from SSS! These cards are AMAZING!,. I need to get some of the new oxide inks, you make it look so easy. I love the three different shades on your paper, it adds such a beautiful effect! Love your ideas to make many cards with not as much effort. Beautiful! Especially love the texture you created with the Oxide inks!